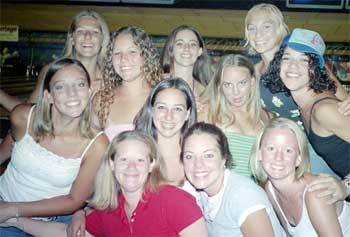 Angie Castle, who was in the 2004 Southwind guard, sent in this one. "This picture was taking while we were in Madison, Wis. That day we had a free day/ fund-raising day. We were doing a bowl-a-thon when some of the guard got together and took this pic. People in the picture includes me (Angie), Alisa (aka Adair), Kristen, Caroline, Shawna (aka baby), Amanda (aka Manders), Robin, Katie, Mary, Cherry and Connie." Thanks Angie!